Antigua is Guatemala’s colonial gem. The small town sits just outside of Guatemala City but breathes a different type of air than the capital city. Whereas Guate is fast, noisy, dirty and busy the town of Antigua sometimes seems to be at a complete standstill at times. The streets are pieced together by awkwardly placed cobble that refuses to allow even the fastest cars to move to quickly through town. The low level buildings are painted in a variation of blue, red, yellow and green and are never stacked too high as to block the view of the stunning and imposing volcano. The rhythm in Antigua is one of a slow dance. 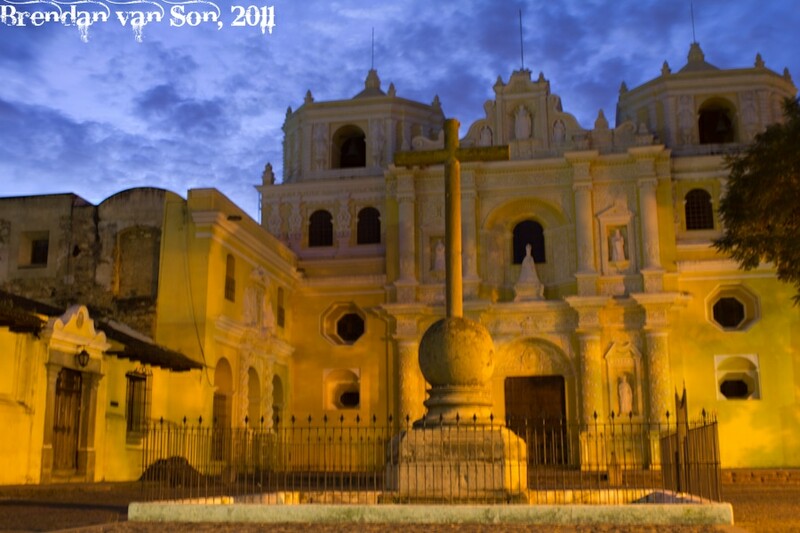 Romantic and intimate Antigua will easily draw your sentiments back to an easier time. There’s no real trick to this shot other than getting up early and being prepared for the right light. There are so many advantages to shooting in the morning rather than any other time of day, as I’ve said a number of times. In this case I actually missed the shot that I was going for because above everything photography is capturing light. As I was passing the church, the light was right. I had intended on making it to another location for the good blue sky that happens about an hour before the sunrises, but was late. Thus, I had to make a choice between location or light. In my opinion light always wins that battle. Great light can make even the most boring scene look dramatic, not to say that this church in Antigua, Guatemala is a boring subject though. Shoot the light, and you’ll never go wrong.